Consider an F18 fighter jet: 60 feet from nose to tail, 45 feet from wing to wing, capable at full throttle of Mach 1.8—just a notch below 1,200 miles per hour—and currently aimed at the deck of an aircraft carrier, coming in to land. From its tail hangs a hook designed to catch a wire stretched across the landing area. The hook is six inches wide. The wire is an inch and a half thick. The plane will touch down at 234 feet per second. The runway is 780 feet long. If all goes well, the jet hits the deck, the hook hits the wire, and the plane stops dead in under three seconds. If all does not go well, it can go, as you would imagine, rather badly. I have no evidence that Geoff Dyer opted to spend two weeks on an aircraft carrier out of a sense of existential identification. The way he tells it, no, it was simple: As a kid he loved model airplanes, military ones ­especially, Hurricanes and Spitfires and De Havillands and Phantoms. That kid grew up to be a constitutionally insubordinate British intellectual, but never mind; when a writers-in-residence program asked if there was a residence in which he might like to write, he requested an American aircraft carrier, and wound up on the USS George H.W. Bush, in the middle of the Arabian Sea. He should have felt right at home. Tom Wolfe, writing about the pioneers of the Space Age, famously described them as having the right stuff. 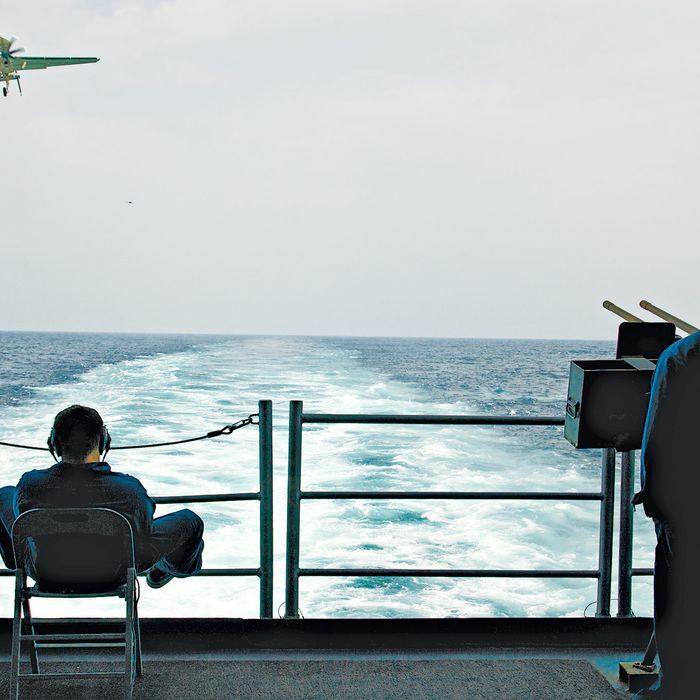 But he got more specific about pilots who land on aircraft carriers: Those guys had “the will, the moxie, the illustrious, the all-illuminating stuff.” My thoughts exactly about Geoff Dyer, who has spent the last quarter­-century launching wildly improbable books out over the literary landscape. Occasionally, as with real jets, they miss and circle around. But mostly, electrifyingly, he lands them. The newest of these books is Another Great Day at Sea, Dyer’s account of his time on that aircraft carrier. It comes out this week, as do two novels not previously published in the United States: The ­Colour of Memory, his first, in which a group of friends drift like stoner fish through the shipwreck of ’80s-era south London; and The Search, a 1993 detective story closer in spirit to Calvino than to Chandler. ­Together, they bring the Dyer canon to four novels, three essay collections, and eight works of nonfiction. None of these books contains the kind of safety features readers (and writers) customarily depend on in literature. There are no plots, no recognizable genres, not even the clear distinction I just drew ­between nonfiction and fiction. All of them, meanwhile, contain things that could go catastrophically wrong. Forget the small-bore stuff, footnotes and digressions and autobiographical intrusions; we are talking about entire volumes based on dubious ideas. I am hard-pressed, for example, to think of a more annoying concept for a book than the author’s inability to write it (Out of Sheer Rage, Dyer’s ostensible biography of D. H. Lawrence) or a less promising one than a scene-by-scene analysis of a three-hour Russian film (Zona, about Andrei Tarkovsky’s Stalker). But here is the great thing about writing: Unlike, say, biomedicine or electrical engineering, it has no intrinsic limits. If you are good enough, you can get away with anything. And Dyer, at his best, is outstanding. He is one of our greatest living critics, not of the arts but of life itself, and one of our most original writers—always out there beyond literary Mach 1, breaking the how-things-usually-sound barrier. A clarification: However you might imagine a fighter pilot would sound on the page—headlong like Kerouac, maybe, or terse like Hemingway, or controlled like Graham Greene—Dyer definitely does not sound that way. He sounds lazy, distractible, neurotic, indecisive—basically like everything you do not want near the cockpit of a plane. Probably you do not even want Dyer near your military. There is no chance in hell he would pass a drug test. There is no chance in hell he would not, as they say, fraternize. There is every chance he would go awol, since he’s always leaving somewhere to amble (though more anxiously than that sounds) someplace else: France, Italy, Indonesia, Cambodia, Algeria, America. In short, if you have never read Dyer, you should not be imagining an unusually erudite young Tom Cruise. You should be imagining W. G. Sebald in Monty Python, or Montaigne on cocaine. All this could easily become tiresome, and, in the novels, it sometimes does. Dyer has the kind of imagination that can lift him suddenly from place to place, but not the kind that can create and sustain entire worlds. In that absence—essentially, the absence of story and character—his fiction sometimes sags toward aimlessness and solipsism. His nonfiction suffers from fewer problems, none of them debilitating, but let’s get them out of the way while we’re here. Dyer is very funny, in the best British tradition, except when he is not very funny in the worst Borscht Belt tradition. He is excellent on desire but ­mediocre on women. In the face of shallow­ness or injustice, he sometimes substitutes knowingness for real engagement, a response that can come off as glib. What’s going on in these sentences is the fundamental business of nonfiction: the translation, at once exact and surprising, of world to word. Writers weight that ratio of exactitude and surprise differently; you can stay close or reach further, out toward the risky and weird. Dyer reaches. You can see it in those precise but strange sidecars, in that startling grammar of ruin, and finally in the sax solo, where, like Coltrane, he pushes so hard on his medium that it threatens to break. Note the word blues, pulling three times its weight—noun, adjective, verb, so much pivoting around it that all the referents go briefly haywire and it seems like the solo is still rising and what’s falling is the sky. And note, too, how the sentence itself is pretty and then dangerous: dangerous because it starts out too pretty (“pretty” is a pretty word; “so high the sky” is Hallmark stuff); beautiful because it ends in so much danger. Structurally, Dyer’s books work the same way that sentence does: They are weird and risky and get things right by reaching all the way out to the border of breakdown. As a result, they are often described as “busting” or “shattering” traditional genres, but that’s not quite right. Dyer writes like he has never heard of genres, like they don’t even have genres in England. He isn’t out to destroy existing forms or showcase some aesthetic conviction of his own—because, refreshingly, his struggle does not lie with literary history. His struggle lies with life. That struggle is about fidelity. Many things that are common in literature are rare or nonexistent in real life (omniscient narrators, personal transformation, chapter breaks), and Dyer wants to leave all that out of his books. Conversely, he wants to include in his books everything he does perceive in real life. Which is a lot. Dyer has a mind like—I mean this as praise, ­believe it or not—a plastic bag: It drifts easily, snags on everything. He notices foreground and background, the band and the bartender and the design on the napkin. He has one eye on life’s lofty stuff—art, war, time, love, history—and one foot in life’s sludge: indecision, apathy, crabbiness, self-doubt, confusion. His other eye and other foot have wandered off elsewhere. At first, these sentences just seem like a tic, one of those unconscious stylistic signatures every writer has. But it turns out their self-negating structure is fractal; it shows up in Dyer’s work at every scale of resolution. You can see it in the books as a whole, which are not at all like X, yet somehow exactly like X after all. (Out of Sheer Rage is not a biography of D. H. Lawrence, except it is a terrific biography of D. H. Lawrence. Zona is indisputably a book about Stalker, yet not really about Stalker at all. Et cetera.) And you can hear it in Dyer’s voice, which is arch and full of artifice and utterly sincere. That is a constraint imposed not by any literary tradition but by language itself, proceeding as it must on its forward march. Dyer pushes back in the other direction, toward simultaneity, overlap, convolution, contradiction. Those are the qualities that compromise his novels, but in his nonfiction, built as it always is around a strong center (a film, a book, a boat, a war), they yield a strange and ­effective form of suspense. Are we ever ­going to make it back? the reader wonders. And then, at perfectly timed intervals: Oh, wow, we’re here. Having said almost nothing about ­Another Great Day at Sea, I will tell you this: It has a lovely ending. It comes, as its author would say, out of nowhere and yet out of everywhere, unexpected and unimprovable. I could say much the same about all his books. Dyer presents as the ultimate unreliable narrator, the kind you let lure you to a party knowing full well he will ditch you midway through to do a few lines of coke in the bathroom and go home with some other woman. And what a surprise, then, to stumble outside at the end of a long wild night, a little stunned and unreliable yourself, and find him there waiting to take you quite tenderly home. Certain books—certain human accomplishments of all kinds—have a kind of meta-beauty. You can be moved by the loveliness of the thing itself, and moved by the fact that someone managed to achieve it. I generally finish Dyer’s books filled with something like vicarious jubilance, awed at what he has done. Or more precisely, at what he has pulled off: a phrase we use, like a dropped jaw or doffed hat, for success in the face of a high risk of failure. But I don’t want to suggest, despite where I started, that the virtue is all in the landing. On the contrary, the virtue is often where you would expect it in work as digressive as Dyer’s: in the throwaway moments. Of everything I’ve read by him, I’ve retained most vividly a tangent about writer’s block from his new book, a few paragraphs in Out of Sheer Rage about Italian drivers, and, especially, a two-page aside in Zona about how Dyer loved and lost a messenger bag. But of course this calls into question the whole notion of a throwaway moment: If I remember these passages best, they are precisely the parts I haven’t thrown away. And that, it seems to me, is Dyer’s point about life. Literature usually gives us a story and sometimes gives us a moral, but life mostly gives us the opposite: not a plot but a lot of set pieces; not happily ever after, but happy, occasionally, in the middle. If there is no overarching narrative, if life has ups and downs but no denouement, an ending but no conclusion, then all we get from it is whatever we love enough to save. By that definition, Dyer’s books don’t just have gorgeous throwaway moments. They are gorgeous throwaway moments, a series of extraordinary asides in the long sentence that is life. Another Great Day at Sea: Life Aboard the USS George H.W. Bush, by Geoff Dyer; Pantheon; 208 pages. *This article appeared in the May 19, 2014 issue of New York Magazine.